Continuing to expand its conferencing audio solutions, ClearOne has released mobile applications to dial and control its CONVERGE Pro 2 line of DSP mixers. The CONVERGE Pro 2 Dialer mobile applications provide dialing and control of CONVERGE Pro 2 DSP mixers on any Android or iOS device. "The Dialer applications are simple to set up and easy to use," said ClearOne senior director of product line management, pro voice, and AV distribution, Durai Ramachandiran. 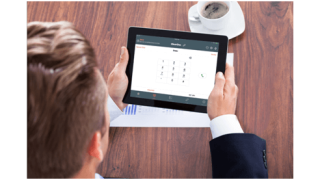 "The apps work with the full line of products in the CONVERGE Pro 2 platform, and provide the most convenient BYOD usage for dialing and control with an intuitive graphical user interface." The software applications can be installed on Android and iOS mobile phones and tablets, and all are easily downloaded for free from Google Play or iTunes. These new applications come on the heels of the already released software Dialer-Controller applications for Windows and Mac OS platforms. These new mobile applications extend choices of devices and interfaces for users, while also providing the ability to connect with an available CONVERGE Pro 2 system; support telephone and VoIP dialers; make and receive calls, including multi-party conference calls; put calls on hold; transfer calls; set call forwarding; add contacts to phone book; view call logs; adjust volume; and more. Choices will be further expanded with ClearOne’s soon-to-be-released Touch-Panel Controller and control modules for third-party control systems. With this new solution, ClearOne will offer the full gamut of controller options: Android, iOS, Mac, Windows, touchpanel, and third-party control systems.